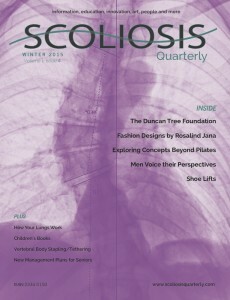 Scolio-Pilates was recently featured in Scoliosis Quarterly! If you know someone with scoliosis, this is an uplifting magazine that goes a long way to make sense of living with scoliosis. Scoliosis Quarterly focuses on scoliosis information, education, innovation, art, people and more. Scoliosis Quarterly celebrates all the scoliosis victories whether it is applauding a surgeon who has dedicated his career to bringing a surgical solution to patients in Ethiopia or the fashion designer who has created works of wearable art for scoliosis patients. It is a great honor to have Scolio-Pilates included in the Winter 2015 issue of Scolio-Pilates.